Islamic Boarding School "Asy-Syadzili" Pakis of Malang in addition to conducting religious education (Hafidz Al-Qur'an) also manages the formal education of Junior High School, Senior High School, and Vocational High School, which has 650 students and/or with the number of 800 Islamic Students. 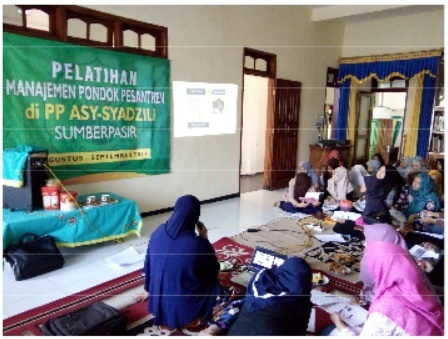 Meanwhile, Islamic Boarding School "Asy-Syadzili" Pakis of Malang is still managed by traditional management, it does not mean that there is no opportunity to be flexible and dynamic in their management. So the management must have the ability to arrange the implementation of boarding school to fit the vision and mission set. Based on the observation of the devotees, the caretaker / motivation of the board is very low, so that impressed the management of the cottage is less than optimal. The purpose of this dedication so that the board of management understand about boarding school management. The methods used ranging from education on financial management, planning functions, organizing functions, mobilization functions, motivation, leadership, and supervisory functions. Followed by training in preparing the work program boarding school that refers to the vision and mission Islamic Boarding School. After training on female Islamic Students, the board has been generated: average attendance attendance is 89.2%, liveliness in training 78,6%, management understanding about management 84% can be understood well, 82% understanding about management finance, and 95% of board can arrange work program of boarding school systematically and based on management functions.